AtlasCare President Michael Grochmal accepts the 2016 HomeStars Giving Back Award. Oakville-based AtlasCare was recently recognized for its fundraising efforts in support of Multiple Sclerosis (MS) Society of Canada. The family-owned and operated heating and cooling services company, which has an 84-year history in Oakville, received the HomeStars Giving Back Award. The recognition is for companies that “pay it forward in their community by donating a significant amount of time, money, material, creativity and grass-roots involvement to local charities in need,” according to a media release. HomeStars is a leading online community of homeowners and home improvement companies in Canada. Last year, AtlasCare raised nearly $70,000 for the MS Peel Dufferin chapter through its annual golf classic event. Since the local company became the tournament’s title sponsor in 2012, it has raised more than $184,000 for the cause. “Our work in support of the Multiple Sclerosis Society is deeply important to us,” Michael Grochmal, AtlasCare president, said in the release. 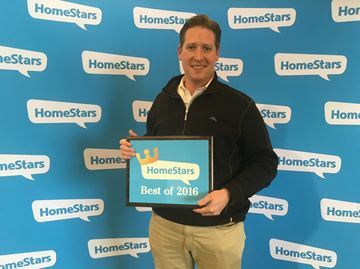 AtlasCare also received the 2016 HomeStars Best of Award, the winner of which is selected based on several criteria, including homeowner reviews and contractor responsiveness. The Oakville company has received the award every year since 2012.